What’s the saying, that if it sounds too good to be true it probably is? That’s Passengers to a tee, a movie that has everything you’ve ever wanted from a pure audience entertainment perspective, but can’t possibly deliver all that it promises. Sci-fi, thriller, romance, action, drama, comedy, and two of the hottest stars in Hollywood; this movie wanted every element it could grab, wanted to become a genre all its own, but made its first mistake in timing. Why it was released in the midst of Oscar Season I’ll never know; Passengers views as a summer blockbuster and might have been a fun way to spend some time on a warm evening in July. In the theatres now, among Best Picture contenders, right alongside Rogue One; that’s just dumb. Over-reaching and over-worked, this film had all the potential in the world and may have slid past as a simple good time during another month, but clunked onto our screens in December instead. In the future, humanity will be able to populate other worlds, and it will be corporations who lay the ground work. Sounds about right, and if you want to move away from Earth the chance is there, if at a very steep cost. On board the Avalon, 5000 colonists are making their way to Homestead II, a beautiful planet that awaits their footprint. The journey takes 120 years, so both the passengers and the crew are put to sleep for the voyage, set to awake in time to train, prepare, enjoy the luxury liner, and then start their new lives. But a problem within the ship’s computer system causes a malfunction in one sleep pod, waking Jim Preston 90 years too early. Nothing can be done, no one else is awake, and Jim is alone to contemplate his existence and eventual death floating alone through space. As more problems arise within the computers, systems begin to fail, and the awakening of another passenger, Aurora Lane, changes everything. 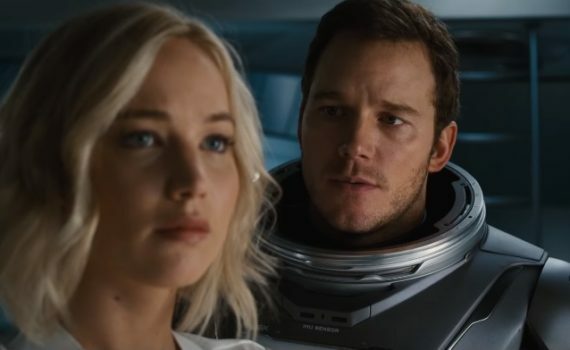 I wanted to love this movie, I really did, and I went in with a completely open mind, prepared for the fact that this wouldn’t be Interstellar, but that it would be enjoyable in its own, unique, Pratt/Lawrence way. And it was that, I won’t stoop to calling Passengers a complete failure, because although it did fail in many ways, I ultimately had a fine time for 100 minutes and would softly recommend it to those looking to spend some time not thinking, just watching. Chris Pratt is the man, and for the first half of the film, he was literally the only man. He took control of the film, took it in a direction that I never saw coming, and had me convinced that this was going to be a shockingly excellent movie. That is didn’t end up that way isn’t to his discredit, and I really did have a blast during the first 45 minutes, was actually challenged morally and intellectually, enjoyed what I was watching as the story unfolded in a direction that I won’t give away here, but was not what was hinted at in the trailers. Then J-Law woke up and the stability of the film begin to weaken, the walls began to quiver. She’s hot, she’s talented, she and Pratt had good chemistry, and for a little while I was worried but not overly concerned, the film was still floating along. But that reminds me of another proverb; a man passing your window as he falls off the top of the building shouts “so far so good!”. In hindsight, Passengers was always in free fall, Pratt was just doing a great job making us forget that eventually the ground would come speeding up to bash our brains out. That moment came when Laurence Fishburne entered the picture, and from then on everything went to hell. He and his character were both awful, Pratt and Lawrence dropped to his level, the action got ridiculous, and any strong foundation that was laid early was broken apart into pieces and scattered through space. This film becomes more a romance than science fiction rather quickly, and then ends as a throwaway action flick, something we may have let fly another time, because it was at least fun to watch, but can’t forgive right now.